Alt Thai News Network ATNN : Thailand: Ending the Regime's "Red Terror"
Thailand: Ending the Regime's "Red Terror"
Breaking down the barriers of fear and intimidation. About 100 red-shirt demonstrators rallied in Ubon Ratchathani province on Sunday against the anti-government People's Democratic Reform Committee (PDRC) movement. 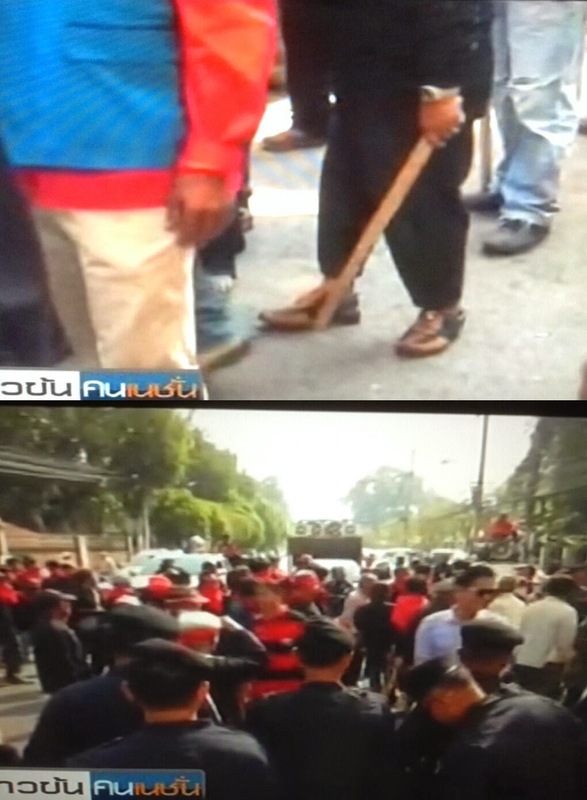 Pichet Tabudda led the red shirts to block an outbound section of Chaeng Sanit Road in front of former Democrat list-MP Vithoon Nambut's home in Muang district. The demonstrators blasted PDRC leaders, including former Democrat MPs Suthep Thaugsuban and Issara Somchai, accusing them of being opponents of democracy. They also urged other members of the red-shirt United Front for Democracy against Dictatorship to protect the caretaker government of Prime Minister and Defence Minister Yingluck Shinawatra. Before dispersing, the demonstrators burnt effigies of Mr Suthep and Pornchai Kowsurat, president of the Ubon Ratchathani provincial administrative organisation, who they accused of sponsoring the PDRC. The flash-mob was assembled as a direct response to the creation of anti-regime chapters all over Thailand including at the very heart of support for defacto dictator Thaksin Shinawatra, the northern city of Chiang Mai. Another stronghold of the regime is the northeast province of Udon Thani. During the unprecedented nation-wide anti-regime mobilization on December 9, 2013, a small, symbolic anti-regime protest even took place here - but was met by club-wielding red-shirted thugs openly colluding with the regime's police. A national movement with well-organized, capable, intelligent, and fearless resistance to the regime and its tactics of deceit, violence, and intimidation has created a widening nightmare for the embattled dictatorship. The presence of organized anti-regime protesters at the very heart of their support base gives the silent majority the courage they need to come out and speak up. The paralyzing fear that has allowed this regime to dig in and stay in power is beginning to fade, and with the eyes of the world upon it, it cannot engage in the gory examples it had once made of opponents to keep the rest of the population in check. 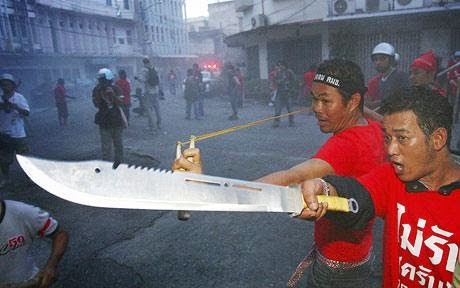 What is Thailand's "Red Terror"
"The yellows flicked rubber bands at reds as they drove past on the way to the airport and also beat them up. When news of this started spreading, thousands of people, those I call the silent force (they are not in our group, they are just normal people who want justice) couldn't stand to hear it and all converged at the house. We knew nothing of this incident until it was over. Apparently the yellow shirts were shooting and beating up the reds and Setha Jiamkitwattana, the father of the DJ tried to get out of his compound. He had a gun in one hand and tried to drive his car into the red crowd to get out. When he was trapped - after all he tried to kill the reds by driving straight at them - he was beaten to death. The media were not in the compound so they only saw one side of the story. The reds there all came following their hearts." For the crime of allegedly "flicking rubber bands and "beating up" red shirts" in Bangkok, a mob of red shirts surrounded and threatened the lives of opponents living hundreds of miles away, eventually killing the father of their target when he tried to escape. The claim that they were just defending themselves, while surrounding a home with guns and machetes in hand, is the sort of propaganda that has been used by the regime's violent supporters to crutch their legitimacy for years - along with a complicit Western media more than happy to bury such stories under tales of a "rich vs. poor" struggle for "democracy." Organisers of last Saturday’s Gay Pride parade in Chiang Mai are demanding an apology from the Rak Chiang Mai 51 group for what they described as an uncivilized action by some 30 red-shirt hooligans who broke up the parade with force and intimidation. There is not much that the organisers who comprise non-governmental organizations working on HIV/Aids problem can do towards the Rak Chiang Mai 51 group as they are too civilized. But they should have known better that even a verbal apology from the group would be impossible because the self-righteous group believes they are above the law and thus immune to any legal sanctions. According to news reports, some 30 red shirts went to Tawan Trendy Mall where a stage was built to welcome the Gay Pride parade which was due to kick off from Buddasathan, through the Night Bazaar and finally ending at the mall. Once there, the red shirts launched verbal attacks against the event claiming that it was unsuitable and would tarnish the city’s reputation. The gang then dismantled the stage and threatened to resort to violence if the parade was to be held forcing the organisers to call off the event. This latest thuggish act by the red shirts associated with the Rak Chiang Mai 51 has not only shamed the northern capital wellknown the world over for the friendliness and hospitality of its people but may turn away many would-be visitors. Several state agencies have avoided Chiang Mai as a venue of their seminars or meetings for fear that they will be disrupted by the red shirts. Veera would go on to describe incidents involving the raiding of several temples belonging to the Buddhist sect of Santi Asoke, the physical assault of a university lecturer who attempted to defuse a confrontation that erupted when red shirts attempted to breakup a reunion attended by one of their political opponents, and the above mentioned murder of an opposition DJ's father. When the Western media talks about "popular support" and a "democratically elected government," the fact that it appears "popular" because of a campaign of systematic violence, intimidation, and terror is conveniently never mentioned. When it is, it is always couched behind excuses for otherwise inexcusable behavior. The regime itself, headed by defacto dictator Thaksin Shinawatra, has by far the worst human rights record in Thai history, with the blood of 3,000 extralegal deaths on his hands. The thuggery of the regime's followers should be no surprise, as these groups are an integral part of the regime's overall strategy of gaining and maintaining power. 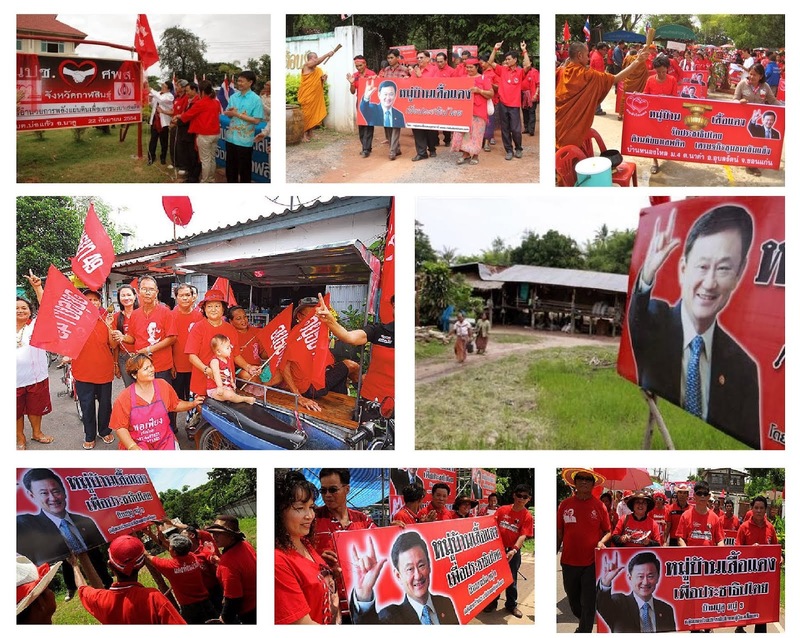 Images: he establishment of politically exclusive zones called "red villages" and "red districts" where Thaksin is literally declaring political monopolies and intimidating opposition from expressing themselves. While the UDD denies this is their intent - there have been horrific incidents of violence throughout UDD's northeast epicenter of support, including the infamous hacking to death of a radio DJ's father after speaking ill of the UDD - covered in an interview with red shirt propagandist Kanyapak Maneejak (DJ Aom) of the UDD's Chiang Mai Rak 51 faction. Kanyapak states that red shirt mobs were simply "following their hearts" when they butchered the old man outside the gates of his own home. Physical violence is only one form of intimidation. Another is borrowed from Pol Pot's Cambodia and Mao's China - the concept of "red villages." A red village consists of regime supporters posting a sign at the village's entrance with a picture of regime dictator Thaksin Shinawatra on it, declaring it "red." It creates an atmosphere of political repression and fear among those that do not support the regime - which is the intended goal - to keep the silent majority silent. These too, are never mentioned by the Western media who claims Thaksin Shinawatra's sister, Yingluck, was put into power through "fair and free elections." But one has to ask themselves: If the regime is so wildly popular, why the need for physical violence and a systematic campaign of intimidation and coercion? The answer is simple - the regime is not popular. As reported in, "Thailand: Survey Confirms Regime's "Reds" at 14%, Nowhere Near a "Majority"," the actual number of Thais nationwide that identify themselves as "red" are only 7% with an additional 7% seeing themselves as only "leaning toward red." Should the truth get out (and it has) of the regime's meager following, and the barriers of fear broken down, the regime will be routed utterly as the silent majority throws off the backward politics of dictatorship - namely fear, repression, and violence. The national anti-regime protests are gaining traction and the silent majority are increasingly shedding their fear and speaking out. The name "Thaksin" in a conversation depicting him negatively can be heard more often out in public, where once people who disliked him feared the "seas" of red shirts they believed surrounded them. The two massive, historical turnouts in November and December of this year across the country dwarfed anything the regime has managed to organize, ever, even at the height of its popularity. The regime has all but given up in trying to organize an equally impressive counter-rally claiming it wanted to "avoid confrontation." With a dictatorship soaked in blood as thoroughly as the Shinawatra regime, that is hard to believe. What is more likely is that they have tried, and failed, to gather such a show of support. The anti-regime protesters must continue breaking down these barriers of fear, intimidation, and violence - and above all - must not resort to the same tactics employed by the red shirts. By providing a peaceful, progressive alternative to the thuggery, fear, and chaos that the regime and its red shirts embody, the silent majority will benefit from and support the movement. By reaching out to supporters of the regime with real, sustainable solutions to their problems, they can further undermine what little support the regime still has. Once the barriers of fear have been completely broken down, 100 red shirts may show up to threaten violence, but they will be outnumbered and their vitriol drowned out. With cameras aimed at them and the eyes of the world upon them, they will only dig the hole with which to bury their legitimacy and their entire movement deeper and faster.